Birmingham’s most prestigious mixed-use development features a geometrically challenging steel roof structure as well as an eye-catching fretwork screen along one elevation. There is nothing quite like making a bold statement with a new and exciting building, particularly one in a prime city centre location. 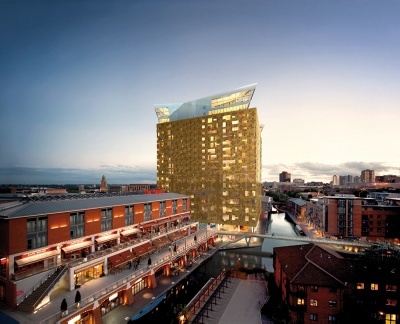 This is the case with The Cube, the UK’s largest mixed-use building and a structure which is set to enhance Birmingham’s most desirable location to live, work and shop. Due for completion later this year, The Cube represents the final phase of The Mailbox development, a large inner city scheme which has transformed a former industrial site into an area of canalside restaurants, bars, shops, offices, houses and apartments. So what makes The Cube stand-out? 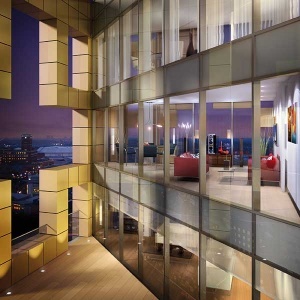 Its size to start with, it has 25 floors in total making it the tallest building in the vicinity. Secondly, the eye-catching bronze and aluminium cladding, and its shape of course. As the name suggests, the building is shaped like a cube, albeit with only three and half habitable elevations constructed around a largely open and hollow central core. Completing the four sided cube shape, the structure’s north western side stops at level 12 and from here upwards to the top of the building a steel fretwork screen spans the 52m wide elevation. The fretwork is not solid and allows daylight to penetrate into the central part of the building. 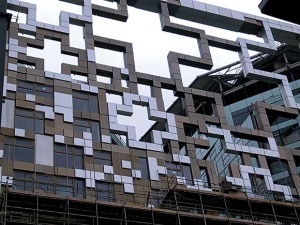 The fretwork resembles a very large game of tetris (the 1990s computer game) and is made up of a series of irregular shaped pieces of steelwork, most of which have two 45 degree angles at either end. These pieces are made from fabricated 400mm x 400mm box sections, with the heaviest weighing close to 5t. Brought to site in various sized pieces the fret was erected from the bottom up, with scaffolding providing some temporary support. At either end the fretwork has pin connections to the building’s concrete slabs, with some of these moment joints which relieve potential thermal expansion. As the giant jigsaw fretwork was erected upwards, the scaffolding – needed for the installation of the cladding which covers the fret and mirrors the exterior of the rest of the building - was also erected. Along the topmost level of the fretwork a fabricated truss spans the void, made from a total of four 300mm x 300mm box sections. The truss provides lateral stability to the connected fretwork screen below, while vertical loads are all transferred via zig-zag paths to the concrete slabs. Apart from the spectacular looking fretwork screen The Cube is essentially a concrete structure from ground floor to the 23rd floor. These levels accommodate shops, apartments and offices, but above this forming the 24th and 25th floors the building is crowned with a two-storey steel structure. Accommodating a rooftop restaurant and a hotel, the steel structure has proven to be one of the most challenging aspects of the entire project. But why change from concrete to steel for the topmost two floors of The Cube? Topping three sides of the structure, the two-storey high steel crown features four overhanging wings, one in each of the building’s four corners. Formed with box sections in the larger northern tips and UC sections in the southern tips, the wings were welded together on site from fabricated pieces. Because of the site’s tower crane’s weight limitations the wing sections had to be brought to site in pieces of no more than 7t. These heavy sections had then to be joined together by high precision welding to maintain the overall geometry. Great care was taken to ensure that the glazing and cladding lines rising from the concrete frame part of the structure integrated with that from the steel frame at these locations. The remainder of the steel structure is a composite design with exposed CHS columns lending the areas an architectural highlight and stability derived from concrete cores. One elevation had to be substantially ‘beefed up’ as it features a 3m cantilever which will accommodate restaurant windows. Heavier 600mm deep plate girders are installed here as the roof above supports the building’s window cleaning machine. Weighing approximately 20t, with a reach of 20m, the machine runs along a track and can reach and clean all of the structure’s windows. 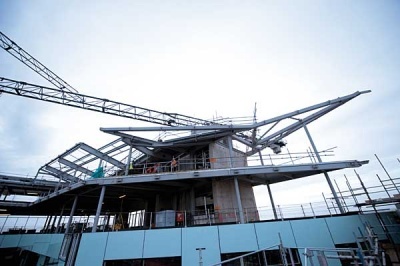 The steelwork package was completed by Christmas and currently secondary steelwork, onto which cladding will be fixed, is being installed around the upper levels of the building. The Cube’s character has emerged with the completion of the fretwork, while the steel and glass angular rooftop structure adds and enhances the structure’s overall architectural appearance. The Cube has been described as Birmingham’s most spectacular building and has already achieved a BREEAM ‘Excellent’ rating. A number of innovations and firsts are included in the structure’s make-up, with the lower levels up to fourth floor containing an automated stacking car park system. Above this on levels five to eight there will be an array of designer retail outlets, while levels nine to 14 will offer approximately 10,000m2 of prime office space. Levels 15 to 22 will consist of 244 apartments, and then above this on the upper most two floors there will be a boutique hotel and Birmingham’s first rooftop restaurant.